"Hello, I'm Johnny Cash," were the famous, self-introductory words uttered by the "man in black" himself at the start of his shows. Johnny Cash, born on February 26, 1932 in Arkansas, would have turned 80 years old today. Famous for his prison-themed tunes that often had rhythms resembling a train puffing down the track, he was also known for his signature color: black. Cash initially wore black out of convenience so he and his band members would match the first time they performed at a Memphis church. 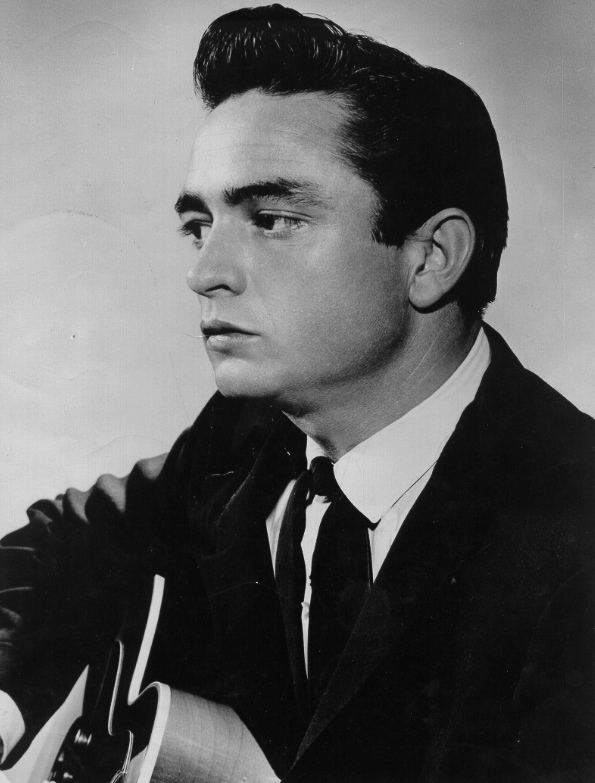 Years later, in a decade where flashy colors were popular in both street fashion and the country music world, Cash released the album Man in Black and clothed himself in the dark hue from head to toe. "Everybody was wearing rhinestones, all those sparkle clothes and cowboy boots," he said. "I decided to wear a black shirt and pants and see if I could get by with it. I did and I've worn black clothes ever since." According to the song's lyrics, his reasons for wearing black were many - "for the poor and beaten down," "for the prisoner who has long paid for his crime," and "for those who never read, or listened to the words that Jesus said." It was also released during the Vietnam War, giving Cash another reason to wear the color associated with mourning. Manuel Cuevas, who has designed stage clothing for legendary country and rock 'n' roll performers such as Elvis and Bob Dylan, kept Cash looking cool by outfitting him in his go-to "uniform." "There's nothing flamboyant about Johnny Cash in his black suits," Cuevas said. "That's a man who had a charisma and who could fill up a room with his presence." Cash's stage attire may have been a fashion risk at the time, but it worked then and would even be considered fashionable today. 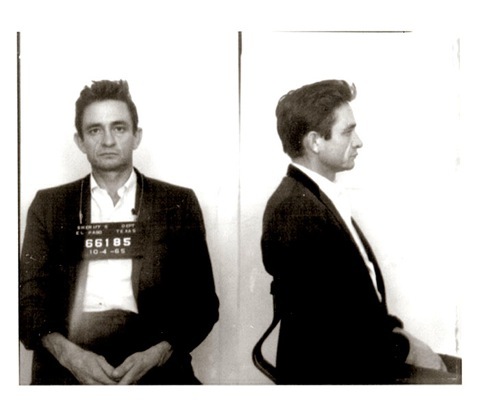 The "man in black" was also known for his prison fixation. He performed at Folsom and San Quentin State Prisons in the late 60s. Clad in a three-piece black suit with skinny pants (something a modern day hipster would pay good money for), Cash lit up the stage at Folsom while the prisoners enthusiastically clapped along and cheered, particularly when he sang about the misdeeds that landed some of them in the slammer. He even performed an original song written by one of the inmates, Glen Sherley. Cash wrote in his autobiography, "I've always thought it ironic that it was a prison concert, with me and the convicts getting along just as fellow rebels, outsiders, and miscreants should, that pumped up my marketability to the point where ABC thought I was respectable enough to have a weekly network TV show." 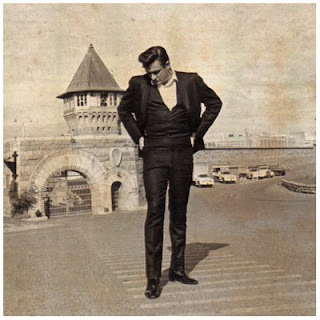 Although Cash confidently sang "I got stripes, stripes around my shoulders" and about being "stuck in Folsom Prison," he never spent more than one night at a time in jail. In honor of Johnny Cash, I made a black top and a "prison-striped" skirt. The black and white stripes are very subtle, so I embellished the fabric by sewing black ribbon on to create an interesting diamond pattern. I applaud Johnny Cash for his fashion sense and color choice. Black is timeless. He summed it up by singing, "Up front there ought 'a be a Man In Black."